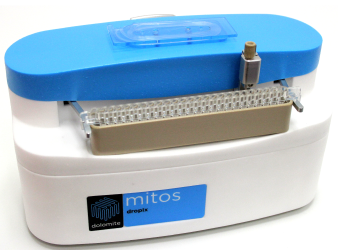 The Mitos Dropix was the winning entry in Dolomite’s 2012 Productizing Science competition. The competition invited researchers from all over the world to bring their ideas for things to be turned into products. The idea had to be something that was proven to work and something that Dolomite could reasonably commercialize. Dropix core science was submitted by Drop-Tech; a spin-out company resulting from scientific collaboration between the University of Cambridge, Imperial College London, and Eidgenössische Technische Hochschule (ETH) in Zürich, Switzerland. The Mitos Dropix is a device that allows a user to digitally program a system to make a droplet sequence up from different solutions. 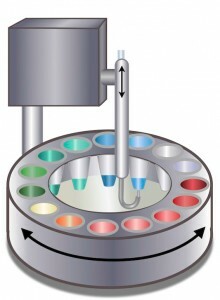 The device can generate droplets of up to 24 different reagents in a single run that can be incubated or injected into microfluidic chips for further analysis. There can be hundreds of droplets in a single sequence, which has great benefits for Biologists and Geneticists, especially in hydrafluid screening experiments. dropix3 web Drop-Tech’s concept was crowned winner of the Productizing Science competition in February 2013 and the project to improve, redesign and commercialize it kicked off in April 2013.The Mitos Dropix uses IP surrounded, intuitive droplet ‘picking’ technology involving movement of a hook between carrier and droplet phases to generate droplets-on-demand. Blacktrace focused on bringing the technology to market by creating a versatile, easy-to-use product for creation droplet sequences of up to 24 different reagents. The first prototype of the Mitos Dropix was ready in July 2013, and the device was perfected in beta prototypes to be ready for launch in Autumn 2013.